In Farmingdale, residents in June approved spending up to $1 million to build a new fire station. In recent years, other local cities and towns have opted to build new fire stations, some with public money and others with private donations. 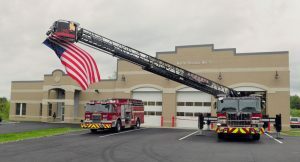 The Augusta Fire Department opened its $4.3 million fire station on Leighton Road in North Augusta in late May after about a yearlong construction process. It’s the first new fire station to open in Maine’s capital city in more than 50 years. The Augusta Fire Department’s new North Station No. 3, shown in May, is on Leighton Road and is designed to reduce response times in the city’s north end. The single-story station has a secure living and office area for firefighter-paramedics on one side of the building, and there’s a fitness space, living room and kitchen area. The majority of the cost is being paid by the city after voters approved $3.6 million in bonds for the new station in November 2014. The city also is spending $6 million to expand and renovate the department’s Hartford Fire Station overlooking downtown Augusta. Work began on the project — which will more than double the size of the station — in July and is expected to be completed by the beginning of 2019. Improvements to the station include a new section large enough to accommodate today’s larger, heavier firetrucks. The addition will have two large drive-thru bays and additional rear-facing bays for ambulances and other vehicles and equipment. The Hartford Fire Station project also will solve structural problems in the current building, which was built in 1920, and provide much needed space for training and modern sleeping quarters for firefighter-paramedics who work 24-hour or longer shifts. 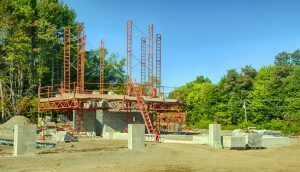 Construction continues Wednesday at the new Winthrop Fire Station being built on U.S. Route 202.
year — will be paid for with a 25-year-loan as well as $450,000 pledged by an anonymous donor. The new station will be about 9,500 square feet and include a four-bay garage with additional space for a boat, an all-terrain vehicle and other equipment. There also will be offices, training rooms, a kitchen, a lobby and parking. The current station was built in 1947 and has limited parking and a floor unable to support a new engine the department is hoping to acquire. 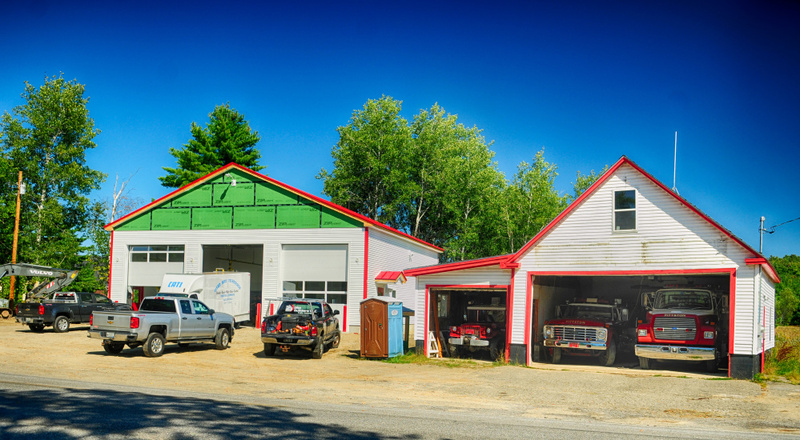 Residents at June’s Town Meeting approved spending up to $1 million to build a fire station. 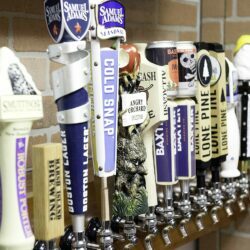 The Select Board has not picked a location for the station, and after Hallowell decided against leasing space in the new building, there may be unused space. The town’s current station, next to the Town Office on Maine Avenue, has truck bays so small the department has to spend additional money on custom-made vehicles. The station is so close to the road that firefighters have to step into the street to stop traffic so other firefighters can back a truck into the station, and it’s in the flood plain. During the Town Meeting, Selectman Jim Grant said he doesn’t expect the new station to cost more than $650,000, but the actual cost won’t be known until the station is designed once a location for it is determined. 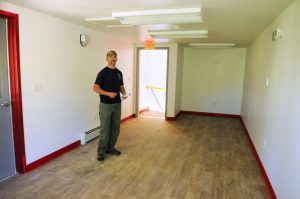 Pittston Fire Chief Jason Farris stands in the upstairs office Wednesday during a tour at the Pittston Fire Department’s new L. Ireland Village Station, under construction in East Pittston Village. Construction of a $350,000 station on Route 194 in East Pittston is nearly complete. The 48-foot-by-48-foot station — roughly the same size as Pittston’s main station on Whitefield Road — will have three bays for two pumpers and a forestry truck and a second-floor loft for storage and a place for firefighters to sleep if they need to do so during a storm. The station will be set back from the road, giving firetrucks space to turn around without disrupting traffic. The project was approved at Town Meeting in March 2016, and additional funding was approved at this year’s Town Meeting.